The rapid rise in rates has been a big problem for the housing and mortgage markets this year. 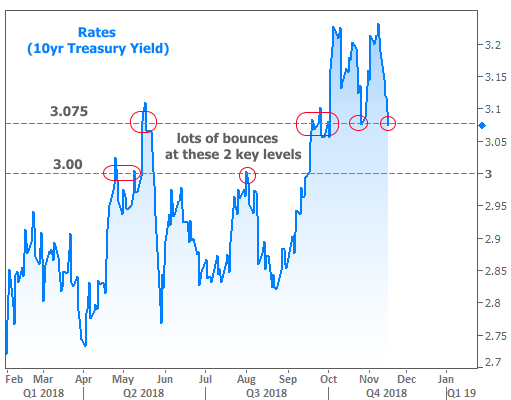 Just last week, some reports suggested rates were near 8 year highs. The same sources reported that rates were ‘unchanged’ this week. One might conclude rates remained at 8 year highs this week, but by Friday, they were the lowest in more than a month! It all has to do with the sources providing the underlying rate data and the media outlets who report on it. Freddie Mac’s weekly mortgage rate survey is the only source of mortgage rate information used by many of the biggest media outlets. That’s unfortunate for anyone relying on those stories for timely info on day-to-day rate changes. Freddie’s survey is accurate in the long-run, but can lag reality by several days. In fact, the weekly survey is really only a “Mon/Tue and sometimes Wednesday” survey. Thursdays and Fridays aren’t counted. 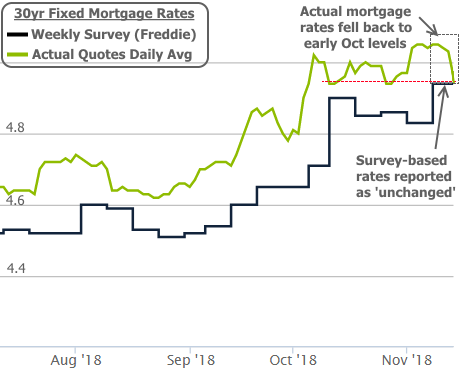 That means big changes in rates in the 2nd half of the week will NOT be reflected in the news stories citing Freddie’s survey–at least in cases where we actually see big moves in the 2nd half of the week. As you may have guessed, we wouldn’t be having this conversation had we not seen big moves in the 2nd half of the week! To be fair, “big” is a relative, but we’ll take the victories we can get these days. The bottom line is that most lenders were quoting noticeably lower rates by Friday afternoon. The average hadn’t been any lower since early October. What accounts for this nice drop in rates? Again, the drop is relative. We’re still not much lower from those long-term highs. Additionally, this week’s move looks similar to the last week in October. In other words, it wasn’t especially big or unique. Even so, gains are gains, and we can certainly point to a few sources of inspiration. 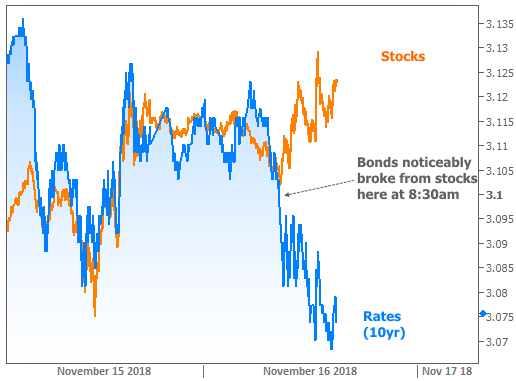 Much like that last week in October, stock market lossestranslated to bond market gains (bond gains = lower rates). Bonds have been more willing than normal to follow stocks in the past month. When stocks experience the kind of panic selling seen in early October, bonds tend to soak up some of the money that’s looking for a safe haven. More demand for bonds means lower rates, all other things being equal. Looking just slightly beyond the stock market, there is at least one more supporting actor. You may remember “Brexit” from 2016–the term for Great Britain’s eventual divorce from the European Union. This is a messy divorce with plenty of negotiation and paperwork. The short version of a very long and boring story is that British lawmakers are having a hard time agreeing on how to proceed, and that could have a fairly big impact on what the final agreement looks like. The bottom line for now is that there was a palpable spike in uncertainty surrounding Brexit. Uncertainty that impacts the global economy tends to benefit bonds and hurt stocks. 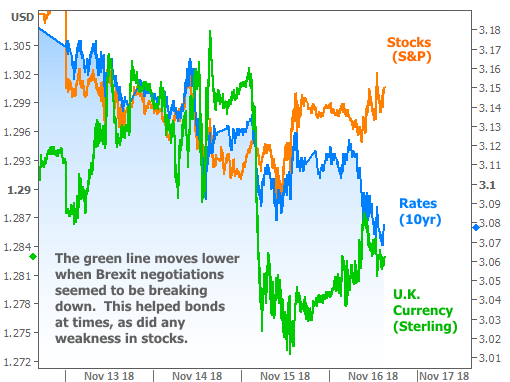 The following chart brings everything together with stocks, bonds, and British currency (a good barometer for Brexit-related anxiety where “lower” = “worse”). This had to do with comments from newly-appointed Fed Vice Chair Richard Clarida, who said that short term rates are currently very close to neutral. That’s a fancy way of saying the Fed might be done hiking rates fairly soon–something that flies in the face of comments made by another official on Thursday who said the neutral rate could be more than a full percentage point higher! In the grand scheme of things, these moves haven’t done anything to bring either side of the market out of recent consolidation patterns (though bonds are close!). It wouldn’t be a surprise to see such consolidations continue into the end of the year. 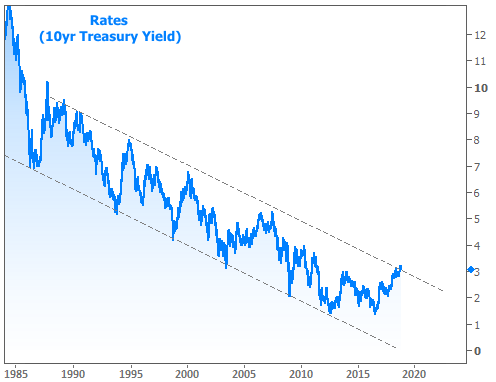 That said, if bonds manage to break lower from here, it would keep at least some hope alive for rates re-entering their ultra-long-term downtrend. In terms of important levels to watch in the weeks ahead, 10yr yields ended the week right in line with 3.075%. That’s been in the thick of things in terms of ceiling/floor bounces lately. Below that, 3.00% would be the more serious threshold we’d need to cross before getting our hopes up too much. 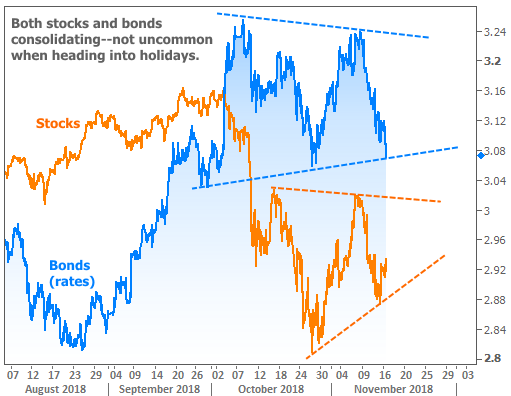 To reiterate though, the holiday season casts doubt on the significance of bond market movement. It may look like something is happening on one day/week only for it to “un-happen” on the following day/week. Thanksgiving week is possibly the worst one to watch as far as getting a reliable idea of bond market momentum. It won’t be until the first week of December that financial markets are back at some semblance of full force for a few weeks before 2018 is in the books.